"Sometimes you take baby steps and sometimes you leap." CONTEST IS CLOSED. A winner was selected and contacted. Thanks to all who entered! It was a joy to introduce so many of you to Noonday Collection. Sometimes you take baby steps and sometimes you leap. There are times when a task feels like a mountain and other times you jump over them like molehills. There are mornings when getting out of bed seems impossible and others where you are so excited for the day you can’t sleep. At times it rains and others when the sun warms your face casting a rosy tint to your cheeks. Sometimes the words are plentiful and eloquent, other times they are bulky and incoherent. There is a time to selflessly serve and a time to humbly ask for help. There are seasons of planting and pruning and times when the harvest is fruitful. The challenge lies in finding the purpose and joy in it all. Every season tucks away lessons and occasions for growing and bettering. It’s our duty to seek the truth whatever the season. This is a lesson that I’m currently learning or I should say re-learning. I hold firmly to the truth that everything is made beautiful in its time. In this I find hope. Then there are the days when you stop taking yourself too seriously and realize that a cocktail and a bit of retail therapy goes a long way. Which is why I’m here today. This pleasantly pink brew is the perfect accessory for spring. A gentle touch of cinnamon and nutmeg blended with rum leans towards a tropical punch but the heady scent of mint wins out giving this cocktail the title of “mojito”. The rhubarb flavor isn’t overly intense but rather lends a floral sweetness that is too light for summer but perfect for the gentle warmth of spring. Today I come bearing more than just a cocktail. I’ve recently been introduced to Noonday Collection – a company that carries a stunning array of jewelry, gifts and accessories with a bold mission behind the brand. The products sold by Noonday Collection are created by artisans from around the world. The money goes to the artists and back to their community as well as helping to fund costly adoptions for loving families. For one of my dear readers, Noonday Collection has offered to give a $50 gift card. If you’d like to enter just leave a comment below. To increase your chances become a fan on Facebook or give a follow on Twitter. Comment below and let me know if you have done either of those. It is a joy to tell you about this great company and I hope you love their products and their mission as much as I do. Now go make a cocktail and start shopping. *I am hosting this contest because I believe in this company and am eager to share it with you all. I wasn’t given anything in return – well, except the excitement of being able to share it. You have until noon on Monday 4/30/12 to enter . At which point I will randomly select a winner. In the bottom of a glass add a bit of nutmeg, lime zest, mint leaves and the lime juice. Using a muddler or the end of a wooden spoon muddle the ingredients. You want to really bruise and break up the mint leaves. Add the rum and syrup, give a light stir then top with ice. Garnish with mint and a thin slice of rhubarb. This is enough syrup to make plenty of cocktails. If alcohol isn’t for you a couple ounces of this syrup added to sparkling water and a squeeze of lime makes a delightful non-alcoholic version of this drink. Strain the ingredients. Reserve the rhubarb to top yogurt, ice cream or oatmeal. The syrup will keep covered in the fridge for two weeks. ps: i was reading through kinfolk today and felt like you should have an article + photos in there. 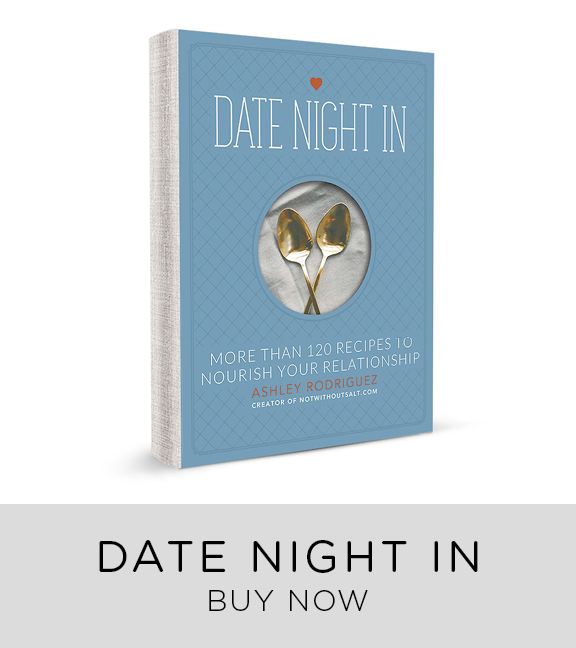 one of your date night entries would be perfect for their “two gatherings” section. I have been trying to find some really gorgeous earrings for what feels like forever, and the ones in the collection definitely fit the bill. Love this drink and love how pink and pretty it looks. In all my years as a bartender, not once did I make a mojito with rhubarb. My loss, obviously. It looks outstanding! That necklace is gorgeous! I’ve been a fan on Facebook for awhile, but still find twitter aggravating. I love your blog, the food is great, and the photos are always beautiful. I hope you’ll post more rhubarb recipes in interesting mediums, because you can only eat so much rhubarb crisp. One of my new year’s goals is to support independent artisans whenever possible, so this giveaway is right up my alley. What a great company. Thanks so much for sharing…both it and the drink! what a refreshing cocktail! It’s perfect for Spring and Summer. 🙂 The products from Noonday Collection are amazing. So many wonderful things to choose from….and best of all, I love their mission. That necklace is gorgeous. Just a little something but not too overwhelming. I would love one! – I also like you on Facebook. Wow, that rhubarb mojito sounds like it would hit the spot today–the first day of actual heat in NorCal. Thanks for the giveaway as well! Would not have expected the nutmeg! Sounds delicious though and looks refreshing! Lovely blog, and thanks for offering this giveaway! Enjoy spring. What a great giveaway! And, this drink looks delicious. I love a mojito and love rhubarb, too. everything is so lovely! a gorgeous drink and beautiful jewelry 🙂 the inca steps necklace is my favorite. I’d like to enter! Thanks!! I really like their collection of jewelry and accessories. They also have some nice tea towels. Mmmm….sounds delish! I haven’t used rhubarb yet, but I’ve been inspired! Wow what beautiful wares! I could do some shopping here for sure! Thanks for the fun recipe and the giveaway today! Those necklaces are amazing! What a wonderful company!! Can we sip these together one nice summer day soon while the boys play? Rhubarb is my new obsession thanks to you!!! I’d love to win…thanks so much! Thanks for supporting Noonday Ashley! I’ve loved being a part of this company as an ambassador in OK. You’re helping a great cause and we all really appreciate it!! Oh, and I have a mint plant taking over in my kitchen so this drink is perfect! Oooooh I would love, love, love to win!!!! Liking on Facebook and tweeting it too! Great give away! I can’t wait to try the cocktail – looks so yummy! Also – that jewelry is fab! This mojito recipe looks awesome- I’m looking forward to making it when I am not pregnant anymore- Yay a great way to celebrate! Facebook, twitter and Pinterest. The mojito looks lovely. Lots of rhubarb and mint around here right now. Gorgeous drink and beautiful jewelry ! Lovely !! I liked you and noonday… But I think that I have “liked” you on fb for longer… Pretty stuff! And I like “things” with a cause. Love your blog and would love to win this giveaway! Hope you have a great week! Oh, and I “liked” you on facebook as well! The cocktail looks fantastic! I never thought of adding rhubarb. what a gorgeous necklace (and drink!). i’d love to enter the giveaway! The cocktail caught my eye immediately! What a great idea. The jewelry looks really neat – and what a wonderful idea. thanks! Love your blog! Appreciate the entry. Heading to like it on Facebook now. i LOVE rhubarb – this looks fabulous! Going to keep my eye open for rhubarb drinks this summer! Thanks for the recipes! I want to try that rhubarb syrup on my favorite strawberry ice cream too. Cheers! What a great giveaway – am I eligible in the UK? I love the pictures! Great lighting, gets me all excited for summer! Cheers to not taking yourself too seriously! Love that necklace, so fun for spring! Love Noonday! The Happy Day necklace is my fave! I’m already a fan on Facebook. Wow! The necklaces are gorgeous! Just stunning! I’m going to check the site out. As always, an inspiring post. I have rhubarb in my garden right now. Must try soon. I’ve just browse the Noonday website, and it looks amazing! What a great giveaway idea. I have always appreciated handmade products! money to take care of themselves and their families! I have yet to try rhubarb- I feel like I’m missing out! Um … If I win does it come with one of these delicious cocktails? (; These look amazing! Love rubarb. Oh mojito season is so so so close. I would have said that it was already here, but it’s dropped 20 degrees in the last 24 hours. But i guess that shouldn’t stop me from enjoying one. Thanks for the reminder to get rhubarb at the market today and make some rhubarb syrup. Oh I love love love noonday….and everything that they are doing! I love the idea of rhubarb mojito! This adorable pink color is perfect for spring. Bring on the good weather (it rains last few days at my home) to enjoy it on the balcony with a few friends! For the contest, you touch my heart of jeweler, this jewelry is beautiful and the mission is honorable. Thank you for the discovery! Thanks for the inspiration. I am now full fledged NWS social follower across all platforms. Gorgeous cocktail! Love that jewelry! I live in Northern Minnesota, and we moved into a home where the biggest rhubarb plant that I’ve ever seen grows every year. I never know what to make with it besides the typical “rhubarb crisp.” Thank you for a new take on this spring plant that I find most daunting to cook with! Also, thank you for keeping it real on your blog and sharing your journey of seeking truth in your day to day life. I just stumbled upon your poppy seek cake recipe, and could totally relate to the need to unplug from facebook, and the other social media that can be great, but can also feed insecurities I didn’t even know I struggled with until it all starts to become a source of anxiety and stress in life. A break from it all can be great. So, thank you! I love your blog! I’m a loyal follower of your blog and already liked you on Facebook! I could use this as a birthday gift for my wife! What a wonderful company with a great mission! Following on Twitter and Liking on Facebook. That drink sounds perfect for a hot day. I love the collection and their mission behind it. I need some new accessories! I also liked on Facebook & followed on twitter. Such beautiful jewelry, and what a great mission! I love Noonday Collection! And that rhubarb mojito? Looks positively divine. Yum. I love the everything about them – the jewelry and the mission. Thanks for sharing. So pretty! I love the Knot necklace. Oh man this is making me intensely jealous that I am pregnant and can’t have one of these!!! Mojitos of every variety are my favorite!! I would love to win the gift card and give my eldest daughter a present. She is doing her masters degree to become a Cardiac Nurse Practitioner. One more year to go, she is a great daughter and a fabulous nurse. That jewelry looks awesome and i can’t wait to try that mojito! I was just trying to think of new ways to use rhubarb, so thank you! I can’t wait to try this recipe. I am attracted to the jewelry shown. Will like on Facebook as well. Thanks. Beautiful jewelery! Would love to win and <3 your blog! Found you from The Farmers Wife, I LOVE Noonday and would be soo excited to win! And, liked you on FB! Please enter me in the contest–thank you! Dude! I’ve been wondering what sort of cocktail to make with rhubarb – these sound and look amazing! I bet fresh ginger could be good in place of the other spices, too. Noonday sounds like a wonderful organization, and I’m glad to learn about them through your beautiful site. Cheers! 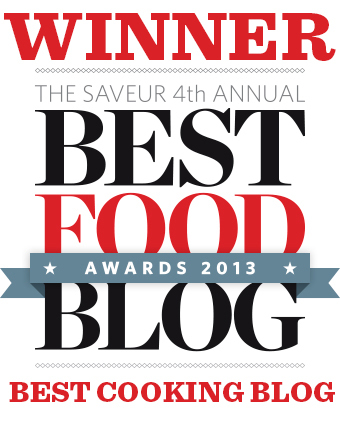 Thank you for the bright spot your blog brings to my day when it graces my inbox! Beautiful. Left a facebook ‘like’ for you as well. Entering to win the gift card. Thanks for the opportunity! Love the Noonday Collection. I love the color of the Mojito! And the necklace is wonderful too! I love rhubarb… thinking I need to try one of those mohito’s. And I’d love a pair of Sseko’s! Looks like a perfect cocktail for a girlfriends’ get-together. And please enter me in the drawing. I’ve never heard of the company but it sounds like a great one for Earth Day! The mojito sounds delicious too! My husband has an aversion to rhubarb as he mother used to stew it until it was a grey sloppy mess and try and feed it to him on icecream. So, whilst he has an aversion to rhubarb, I think the fondness he has for rum, rather with the fact that it remains a blushing shade of pink, may mean this enters our weekend drinks menu! Also, already liked on FB. What I would do for a pitcher or those right now! I pressed ‘like’ – please enter me to win. Thanks! I love rhubarb, will try this cocktail out and pass along if OK? Both the cocktail and the Noonday Collection look marvelous! Gorgeous cocktail, Ashley! I have no doubt I’d love it. Thanks for the introduction to Noonday Collection, love their stuff! Just signed up to “like” you on FB. What a great giveaway!!! I just bought a necklace for my sister from Noonday… beautiful stuff!! enjoyed reading about Noonday! Also, I liked on Facebook! Had a cherry rhubarb margarita at dinner at Frank in Austin Texas tonight, cannot wait to try this drink. Cheers! Love the idea of companies giving back to others. Liked the company on FB. Sounds groovy, hope I win! OK, did a FB like! Love the necklace. Love the drink. Love the photos! Ahsley, what you do is amazing amazing amazing! Never been a big fan of rhubarb but I’m intrigued by your mojito…gonna have to give it a try! I love the jewelery and the philosophy of the brand. Thanks for sharing. I am going to try this cocktail, maybe even this evening! I made sure I was following you on both Facebook and Twitter! Love Noonday Collection and what they support – also like the nonalcoholic suggestion for the drink. I need a good summer drink to get me through the end of this pregnancy! Very cool looking–will have to do a little lunch time shopping this afternoon! And I told my roommate that we need to purchase some rhubarb at the market Saturday morning to create these amazing looking mojitos Saturday night! Thanks for your inspirations!! Beautiful necklace! Thanks for sharing the info about this company! Oooohhhh… such a fab combination. The mojitos look so refreshing and a great addition to any summer party. The necklace is absolutely gorgeous! Thank you for a chance to win. Sounds like a great way to help those in need, and the jewlery is beautiful. I love rhubarb, especially in pie form! I’ll have to try this drink soon. I typically don’t buy jewelry, but one of my favorite things to do while traveling is to visit local artisans’ shops or booths at town bazaars and farmers markets. Hopefully I can find something and show my support with a purchase that is not only a boost for them, but also for the local economy and handmade/fair-trade practices. found you on FB and liked! I liked noonday on facebook.There’s a lot on their site that I would love to use the gift card for! i LOVE noonday!!! thanks for the awesome giveaway. I’d like to enter! Such a great cause and concept! what a great giveaway! also-your chocolate chip cookies are to die for. Mmmm. This sounds amazing, I am currently obsessed with rhubarb so I must make this. Loving the “Happy Day” necklace! I love supporting artisans trying to make a solid living for their families. Thanks for the info! Oh my goodness! That stuff is so cute! Pick me! A rhubarb mojito would hit the spot right now! Lovely giveaway! I’m always happy to learn of companies like this. Thanks for sharing! I would love to be entered in the drawing! beautiful photos as per usual. the pinks & greens make me happy. noonday collection sounds like a great company to support! what a great way to introduce us to them. Nice recipe. I love mojitos, and the rhubarb gives it such an interesting twist! Made the mojito with half the sugar, and it was perfect for a warm spring day. Thanks for the recipe! And entering the giveaway. mojitos & jewelry it is a good day! Oh and I also like you on FB! Thanks for sharing the noonday site with us – beautiful work and a great mission I’d be happy to support! I am a fan on Facebook. And I am a big fan, in general. I adore your blog, especially the “dating my husband” stories. i love rhubarb but have never used it in a drink, looking forward to making this recipe! Love the necklace and the entire collection. How would anyone pick a favorite? (Liked you on facebook as well). i love noonday–thank you for the chance to win! I’m a huge fan of Noonday. If I won I’d have to think really hard about whether or not to buy something for myself or get my sister a pair of Ssekos. I’ve got a well loved pair and think she’d love a set too, but, there are so many other Noonday items I adore. Love their stuff! Thanks for the chance to win! What a great idea! Love the jewelry. Thx for sharing! Lovely jewelry and so nice of you to have a giveaway! Thanks! I love the alpaca arm warmers and hats. What a wonderful company, and what wonderful things they do. Rhubarb in a drink! FANTASTIC! The items at Noonday Collection are just stunning! What an incredible company. Thank you for sharing! I really enjoy your easy flow when you write. Laid back and natural. Would love a necklace like that one too…. that rewind clutch is lovely! that would be my pick. the patchwork clutch and the journals also caught my eye. thanks for the lovely giveaway and the always amazing posts! much appreciated. Lovely. Can’t wait to try that cocktail! What lovely jewelry, I love the bone earrings! And, I all of your rhubarb recipes are wonderful, we tried the rhubarb cake the other day and we devoured it. Thank you. now following you on twitter–it’s about time! this recipe looks phenomenal. i’ll take any excuse to use rhubarb. and in such a pretty beverage? SOLD. I just discovered your blog being sucked in by the title. I love your photos and will be back! wow, that necklace is gorgeous…and the mojito looks delish! pick me! Love all of it. Follow your blog regularly and am already a fan on Facebook. i liked you on fb! and that necklace is so gorgeous!! I would love to win this giveaway. This little pick-me-up is exactly what I need right now. I love stuff like this, where families can earn $. For our 25th anniversary this year, my husband gave me just want I wanted – we gave 2 goats to families through Heifer International. 🙂 Loved that. I love mojitos! And rhubarb is such an interesting addition! rhubarb is about the only thing that’s more accessible in the canadian prairies than for our southern friends.. reminds me of home 🙂 thanks for a good way to start the day! Yet another reason to take you (and Ina) up on the suggestion to try fresh nutmeg. I have yet to buy one, but this may be the recipe to start with! Looks like the perfect adult summer refreshment. I’m thinking a saturday hubby date on the back porch while the kids nap! Beautifully portrayed as always. Turquoise is my favorite stone! Beautiful! Ooh, those necklaces are pretty! And the rhubarb cocktail looks mighty tasty as well! This looks like such a wonderful summertime drink – I don’t have too much experience with rhubarb, but I’m definitely looking forward to trying this! I’m so happy rhubarb has made its appearance once again! Great recipe! Left a comment and just started following on Facebook! Noonday looks amazing- what a great idea! I love your site! Thank you so much! GORGEOUS jewelry. And cocktail, of course. dreaming of mojitos right now! 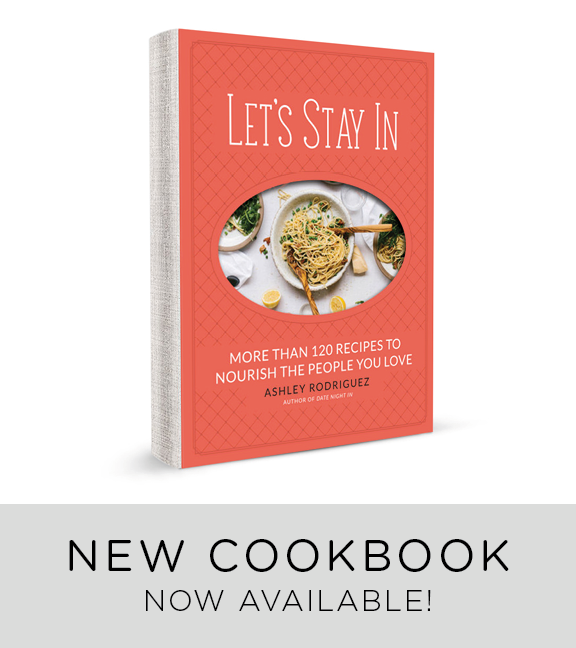 Love your website – so many good recipes! I just came upon your website today. Lovely pics! I am hoping to make the rhubarb cake soon. Anything made with Rhubarb has my heart! Also, I’m a faithful facebook devotee <3 – please enter me in the drawing! I just looked at Noonday’s website-they have some great stuff! I love the necklace you pictured – reminds me (in a horrifically nerdy way) of the computer game Minecraft, and its priceless diamond blocks. I would love to get something from that site! I’ve also liked you on Facebook and followed you on Twitter. I’ve been a fan of this site for a few years now and all of my friends RAVE every time I make the Salted Chocolate Chip Cookies for an event (although I do leave the salt off of the top, because I’m the only one that likes it). Your recipes are fantastic! Can’t wait to try this mojito! I’m a little late to join, but I must say that hot fudge pudding cake looks so delish!! Thank you for sharing your skills and passion! Noonday looks like a good spot for some sister and girlfriend gifts. I’m eager to use my rhubarb! I’ve read and loved your blog for a long time now… and I’d love to win. I’m already a Facebook follower as well. Thank you for your continued, wonderful blog! Noonday has some beautiful pieces! I would be so excited to win! I liked Noonday on Facebook. I am following Noonday on Twitter. I have been looking for a rhubarb syrup recipe because I <3 rhubarb and have run through all my usual recipes already! And a giveaway too! wow! I especially love the jewelry. I was already a fan on facebook, and have now joined your following on Twitter. Love your posts. This mojito looks absolutely delicious! Thanks for the giveaway and I am looking forward for rhubarb season to try this refreshing cocktail. because mojitos and charity always begin at home. I love that necklace and the cocktail looks divine! Happy Spring! I am not quite sure how I stumbled across your lovely blog last year, but I remember the first recipe and story I encountered was yam brûlée. 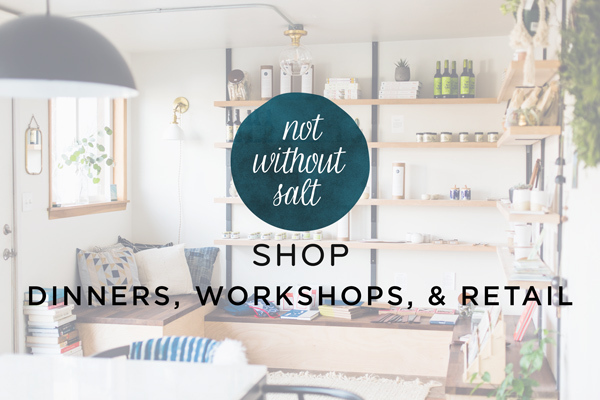 I knew that very instant that I was going to be great friends with notwithoutsalt. I have been blessed by your deep love for your husband, children, and good food. Thank you for sharing a great shop with a great cause! Your twitter, Facebook, and instagram is always such a delight! Thank you! lovely! mojitos are my favorite. and that necklace is beautiful. I’ll have to tell my mom about this cocktail recipe – she loves Mojitos and is always excited to try new recipes! Rhubarb is wonderful in pretty much anything! mmm… RHUBARB! I’ll have to make this for my husband and thank you too for the giveaway and hard work you do for this wonderful blog. Rhubarb mojitos sound really good!